I’ve tried to figure out the words to say this, going over in my head different ways of putting it out there. And most of the time what I am thinking would work, I just don’t remember what it was when it comes to putting pen to paper, or fingers to keyboard. It’s a new year and I have to pull my finger out, head down-arse up, knuckle down, get a move on. Basically make some decisions and get on with the work that needs doing. This blog has been unused for some time, I’ve lost interest in the banality as I’ve branched out with others – food, photos, market, and my writing – and even my crafty one has been sadly neglected. What I am saying is that I will be taking a hiatus from here but not from blogging altogether. You will still find me floating about the blogosphere. I have to get out, take more photos and practice practice practice. I love the foody posts, it’s my way of sharing a little bit of my state with the world from a layman’s point of view (as compared to proper food bloggers/reviewers who pick everything apart and can be a tad pretentious). The market page is self explanatory and my craft, my lovely beaded work I have to get back into and blog more about it. My writing, I am really enjoying what I’ve been working on, and hope to get it out there in some form. It’s a work in progress. But enough of that. A new year means new beginnings, new adventures and learning new things. For those that don’t already follow and haven’t seen my photos, check out the pictures of Sydney-Hobart yachts I took this morning. Clicking on the picture will take you there. Thank you to all who have followed, liked and commented, it’s an honour every time I see the notifications box. Have an amazing 2015, may it be big and exciting! 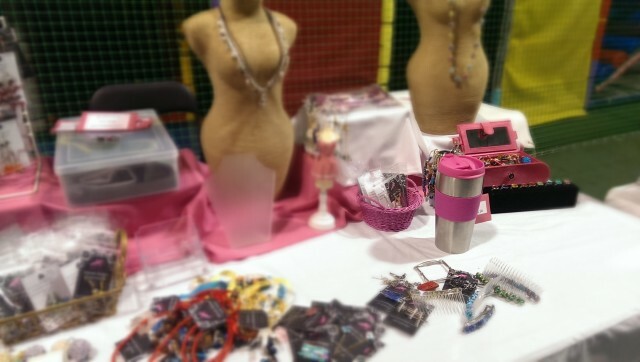 I have a big fundraiser market tomorrow and today was designated set-up. A beautiful sunny last-day-of-Autumn day. Gotta have a coffee on hand for a job this big…..
McMansion Monday and the week ahead. 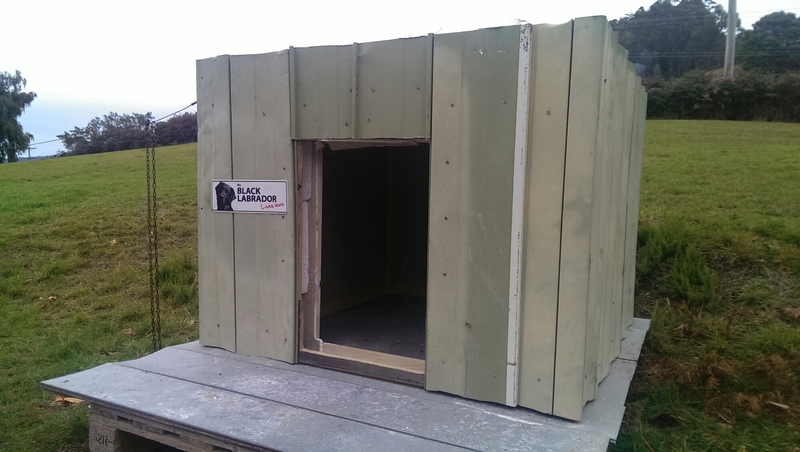 Following on from the title, the dog now has a super sized kennel. I’ve nick-named it the Doggy McMansion for its size. 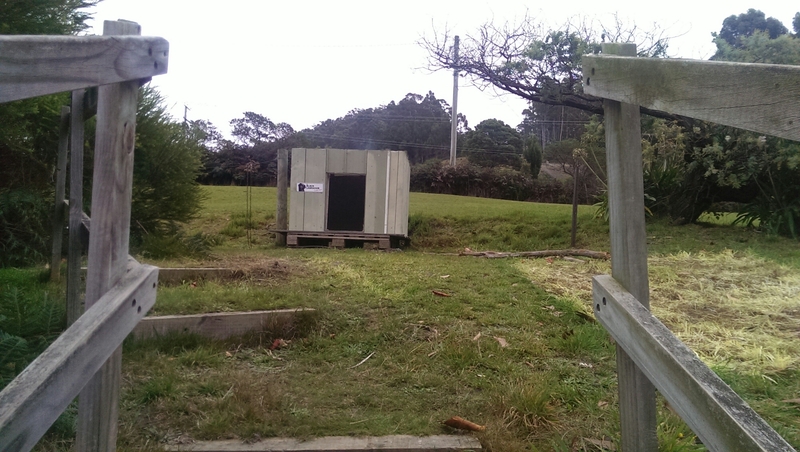 An apple bin and a half, fully insulated, with plaster walls, and when were finished it will have a proper roof with shaded area on the grass for him, and guttering, and he even has a verandah. Spoilt much. Putting it here from construction in the carport was a feat of brute strength. Picture a scene from some movie where kings are carried on thrones through the streets, a man (or more) at each corner. That was us. Thankfully the dog was not anywhere near his house. Photography – I’ll see what I can do. Nothing planned, but I need to get out there. Crafty – there are felt bags to make, or at least try some test ones, a market to email and see if there are spaces available for this weekend and always things to make. Market – post market round up, start thinking on the next one, send out an email explaining some things. Sounds like a pretty normal week for me, adding in the call outs to friends and appointments that invariably pop up. Yesterday was Australia Day, Jan 26th. Still a day of contention and BS. I’m not going to comment on any of that. Each year at Kingston Beach – 30 mins north from us and 10 mins south from Hobart – they have the “Day on the Beach”. Years ago it was all about the sand sculptures – which were amazing – now it’s a fun day out, beach cricket and volleyball, thong races (inflatable thongs, aka flip flops) with all the food, drinks and entertainment you can poke a stick at. Hubby wanted to go along this year and while interested I didn’t the idea of walking for miles after finding a car park. Problem solved. Five kilometres up the road is the Sports Centre with oodles of parking. Bring in the double decker buses and for a small donation, park and ride with not traffic congestion. In the end it was just myself and mr 9 who went. I spent some time at the market along the road (gotta scout for prospective stall holders) while Mr 9 seemed happy to learn volleyball. And that’s where he spent most of the day. I had it easy. Lots of pictures, met up with hubby and mr 14 who brought the bike for a spin, was sighted by, but missed meeting a fellow blogger and Hobartian (we’ve confirmed it was me she saw), got sunburnt, a long wait for the return bus, and finished off the day with a lovely bbq at my parents.